Finalists of the 2017 Open Innovation Forum Food and FMCG Pitching Competition. Like fashion, food trends are constantly evolving in today’s digital age. With growing interest in superfood ingredients, global flavours, new-age beverages and “Instagram-able” meals, this rapidly changing environment makes it a challenge for any customer centric food company to keep up. When looking to develop new, in vogue products ahead of their competition, these companies strive to anticipate what the next food fad will be and how to effectively present it to the market. With 1.8 billion new images being uploaded onto the Internet every day, and the popular trend of sharing food pictures on social networking platforms, a valuable wealth of information has been created. This information is giving companies insight into what foods and drinks people are consuming, and what they are buying when going to the grocery store or eating out. However, challenges arise as 80% of the images on social media do not have proper tagging, meaning that they cannot be accurately searched or analysed using text. The winner of this year’s Open Innovation Forum Food and FMCG Pitching Competition, start-up company Dashmote, was established to solve this exact problem. They saw potential in being able to unlock these online image resources by combining visual recognition data and AI. By using visual recognition technology, patterns can be identified from across global markets and then narrowed down into regional insights. Since starting in 2015, Dashmote has worked with a number of companies from various food and beverage categories such as coffee, beer, snacks and spirits. Dashmote’s proprietary technology analyses billions of images and data that is publicly available on Internet platforms to identify and predict future consumer trends. By using consumer-generated information, such as photos from social media sites and blogs, Dashmote gains direct and unfiltered insights into people's tastes and preferences. This gives Dashmote’s clients a reliable and data-proven picture of what customers need and want, allowing the company to communicate appropriately with their customers and to then provide their consumers with the products that they want. 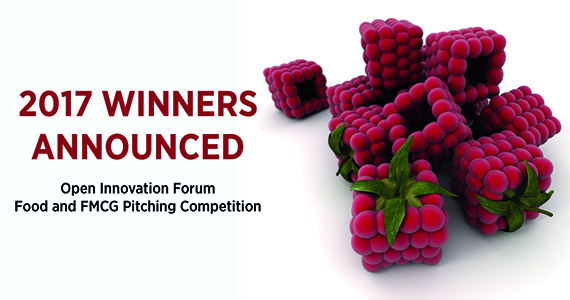 The Open Innovation Forum Food and FMCG Pitching Competition is an annual competition that provides an opportunity for innovators to pitch their ideas to senior leaders of major companies across the whole value chain in the Food, Drink and FMCG sector. Run by the University of Cambridge’s Institute for Manufacturing (IfM) knowledge transfer arm IfM Education and Consultancy Services since 2013, this year’s event was hosted by the Heineken Experience in Amsterdam. Dashmote co-founder Stefan Tan (left) and Pitch Competitiion coordinator Dominic Oughton. The 20 finalists selected pitched their innovation to a panel of senior leaders and decision-makers from major companies across the whole value chain in the Food, Drink and FMCG sectors, including ingredients and materials (Cargill and Treatt); packaging (Crown and RPC) and process (Domino, Cambridge Consultants and Siemens); brand owners (Mars, PepsiCo, Heineken, P&G, Pladis Global, General Mills, Moy Park, LucozadeRibena, Fresca and Samworth) and retail (Boots-Wallgreens). The ideas were presented as a five-minute pitch followed by a Q&A session. Using a points system, pitchers were judged on their degree of innovation, if their idea addressed the company's’ innovation needs, and how much scope it had for commercialisation. Klydo – A data analytics and machine intelligence company that has developed a market intelligence platform that analyses content for underlying trends in consumer behaviour using natural language processing and machine learning. Spoon Guru – A consumer search optimisation provider that has combined machine learning algorithms and big data processing capabilities with nutritional domain expertise to develop innovative dietary management solutions. mealhero – A smart food service that provides a complete meal solution combining an Internet-connected steamer, home delivered ingredients and smart phone assistance to choose meals. Ederna – A company that has patented an innovative solution for the cold concentration of sensitive food liquids and ingredients that protects product quality and reduces energy costs by 50% compared to thermal evaporation systems. The following entrants were selected to be finalists to pitch their innovation to the panel of Food, Drink and FMCG value chain industry leaders.